Many older and classic vehicles feature engines with over-head valves (OHV) which are opened using finger type rockers which in turn are lifted via pushrods and/or cam followers by the camshaft lobes. These finger rockers usually carry a screw and lock-nut at the pushrod end which is used to set the valve clearance adjustment while the opposite end has a rocker pad which comes into contact with the valve stem tip when opening the valve. 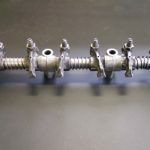 Each rocker is mounted on a shaft, which, in turn, is bolted to the cylinder head, and held in position directly above each valve using a series of either springs and/or spacers. As the engine rotates through its firing cycle, the rockers pivot on the shaft and open the valves in a sequence determined by the camshaft lobe positions. 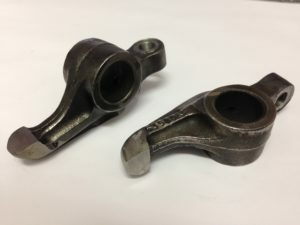 During operation, both the rocker tip and valve stem end are subject to wear along with both the bush, (or housing on which the rocker pivots) and the supporting rocker shaft itself. 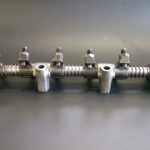 At H T Howard we can fully remanufacture your worn rockers or rocker shaft assembly. The rocker pad which comes into contact with the valve stem end can be subject to wear which leads to inaccuracy when adjusting valve clearances and subsequently a noisy engine. H T Howard can help to prevent this by re-facing the worn rocker pads using a dedicated jig attached to our BERCO RV20P valve re-facing machine. The jig allows the rocker to be centred vertically using a pair of tapered cones which locate in the rocker bush bore. 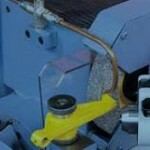 The rocker is then free to pivot while the moving slide of the machine is operated simultaneously to draw the worn rocker pad across the grinding wheel in order to remove the wear and profile the pad back to its original shape.